Thailand has the friendliest people that we have met in our 10 years of cruising, and Phuket is a delightful area - the frustrating Immigration and Customs practices are a major downside to this cruising paradise. Here is our view of Thailand, or go straight to photos from a grand tour of the country that we made when Judi's sister and her friend visited in July 2002. 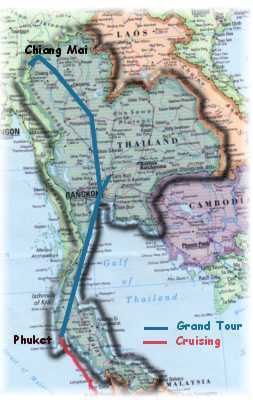 Thailand is a Kingdom, with a string of kings dating back to the 13th century AD. The capital has moved around over the years and finally settled in Bangkok in the 18th century. Although influenced by outsiders such as Chinese, Khmer, and Western countries, Thailand has maintained its independence over the years, and avoided being colonized like many of its neighbors. 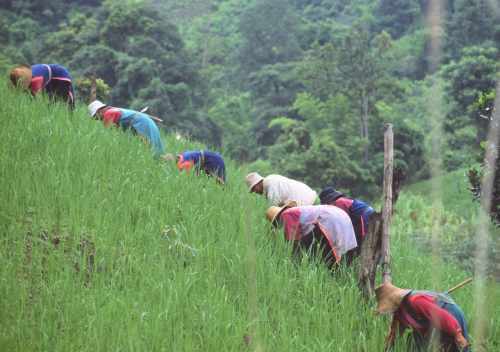 Most of its 60M people live in rural areas with rice as the most important crop. They revere the Royal family, and no one is allowed to speak ill of the king or his family. Recently the borders with Myanmar (Burma) were closed over insensitive comments about past kings. We found the cost of living quite reasonable, and many Westerners settle in Thailand because their retirement income stretches twice as far as in the US or Europe. Medical care costs 25-50% of US prices, and seems reasonable for routine care. In fact Thai hospitals are advertising package tours in The New York Times that include a week on the beach and full physical exam, for the same price as the exam in NY. Immigration and Customs are quite bizarre: tourists may only stay 28 days and then we must exit (1 minute is enough) but it usually takes a whole day to get to a border and back and a cottage industry has grown up ferrying tourists to and from the borders. Customs allows yachts to stay 6 months (or maybe 12 months) and extend the stay if you're having work done on the boat (or if the weather is too bad to sail, or it is Thursday, or...). Import duties range from 30% to 200%, and all cruisers avoid shipping items into Thailand if at all possible. Phuket is a resort island on the southwest coast facing the sunny Andaman Sea. Visited by tourists from around the world, it abounds in attractions - beaches, snorkeling, hang-gliding, elephant rides, and cultural shows. It also encloses a large bay that offers protected waters for sailing, canoeing, and other water sports. During the 'high' season busloads of Asian tourists and mini-vans of backpackers race from hotel to beaches to tour boat terminals to souvenir shops taking advantage of sunshine and reasonable prices. 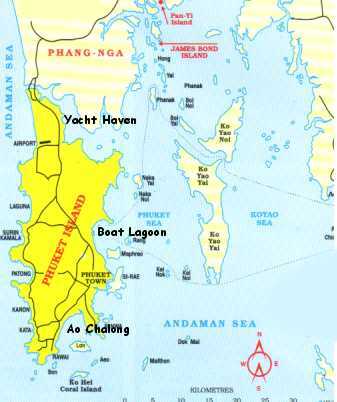 For the cruisers it has 2 marinas (see the Phuket Destination page), many anchorages, and a wide array of yacht services. For photos, we took lots while were there. In the bay there are many islands, some secluded and laid back, others chock full of attractions - Phi Phi Don is one of the latter, with crooked streets packed with funky restaurants, dive shops, vendors selling all manner of souvenirs, Thai massage parlors galore, and internet cafes on every corner. The capital is the big city with high-rise buildings, maddening traffic jams, and smothering smog. Among the modern shopping centers are many temples and wats that provide fascinating history lessons as well as beautiful photo opportunities. The Royal family lives there, and tours of the Grand Palace show levels of artistry and expense matched few places in the world. Taxi drivers are often mad, and on one of our trips to airport we could see the hereafter as he rode the bumper of the van in front of us at 80 mph! Near to Bangkok is Ayuthaya, capital during the 1500-1700's and a small preview of the grandeur of Angkor Wat in Cambodia. For more photos, check out ours. Nearby beaches such at Pattaya, tours on the Thonburi canal system, and visits to the floating markets at Damnoen Saduak in the Rathchaburi province round out the many attractions of this cosmopolitan city. The northern part of Thailand is higher, cooler, and more rural than industrial Bangkok. As a tourist destination, Chiang Mai has lots to offer: we took elephant rides, visited hill-tribe villages, took cooking lessons, and left with many attractions unvisited. Chiang Mai is a delightful destination, a compact town with a moated wall reminiscent of X'ian , lots of funky restaurants, and night markets that sell everything under the sun. One specialty is wood carvings, and they have them from 6" crude tourist pieces for $2 to 10' wall hangings for $thousands! We bought a typical one from an artist at a wat, and immediately shipped it home. Nearby Mae Hong Son is a quaint town, at one time a drug producing center, now a tourist destination (with perhaps still a little drug growing on the side) near the Myanmar border. We took lots of photos of this area also. Thais, in our experience, are very hard-working and quite honest. We feel we have been treated fairly by all (but one) of the companies and workers at Boat lagoon, and feel quite safe on the streets of Phuket and Bangkok. There appears to be a lot of graft at high levels, and every week there is a scandal in the newspaper, but so far it has not touched us. 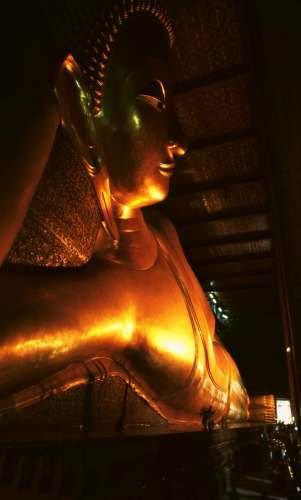 Thailand is primarily Buddhist, thus they are very tolerant of anything and anyone and believe each of us will get our just reward (good or bad) in the next life as we strive to achieve Nirvana. The many Muslims and Christians are tolerated and there appears to be little religious antagonism. The press is free to criticize the government (and often does) but the Royal family is off-limits. The military seems to have significant power, and in the recent yelling match with Myanmar, it came out that the Army has over 125 radio stations that it was using in villages to criticize the Burmese - seemed strange to us. All in all, it is very easy to live in Thailand, and to get along with the Thais - and many cruisers find it impossible to move on. It took will power, but we finally broke free and set off across the Indian Ocean with Sri Lanka as our next destination.